Continuing with the theme of classic Hawaiian symbols and stereotypes, islands are definitely right up there. Islands are intrinsically romantic - plus people often have this fantasy of having one's own secret island. View from Poolenalena Beach on Maui. Island images of coconut trees swaying in the wind. 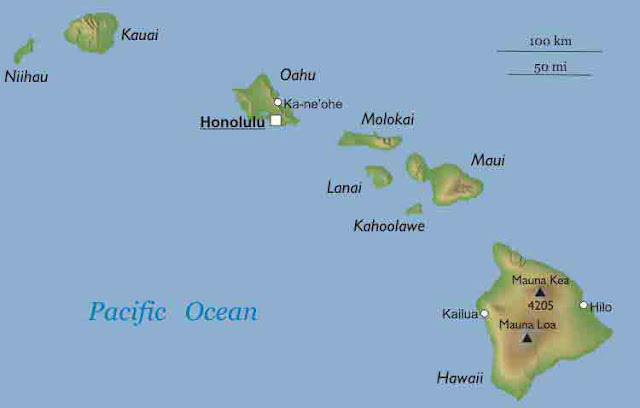 Hawaii is composed of eight major islands and lots of smaller ones that stretch at an angle to the Northwest. I wish I could put names on this map. The bottom right corner is the aptly named BIG Island, aka the Island of Hawaii, which is the same name as the state of Hawaii. The second largest island is Maui, where I live. BTW, feel free to play with the map. You can scroll up or down and zoom. Is island living all it's cracked up to be? Is it paradise? Well.... Some people joke about island fever, also known as rock fever. Island fever is when you are feeling trapped on the island, and have this intense desire to keep driving in a straight line. But you can’t. You’ll go into the ocean. A lot of military personnel on Oahu seem to suffer from rock fever. There is no bridge that connects the different islands. They are not that far apart really, but it’s not like Key West. I think if someone ever wanted to connect all the islands, there would be an uproar, and it would probably take centuries to build because that’s how long government construction projects seem to take here. If you’re shocked, you may want to read my take on Hawaiian style road work. Here's another map with names! Source: Worldmapsinfo.com under a creative commons license. There is no ferry that connects the different islands either. There was an attempt at a Super Ferry, but it went bankrupt. It didn’t help that many people opposed it because there was no environmental impact statement done, and there were concerns about spreading invasive species from one island to the others, plus other concerns that were not addressed. However there is a ferry between Maui and Lanai. Life on these islands is definitely slower-paced than the continental US. We even have crappy internet! Cars even go slow. Sometimes shopping is slow, as I'm waiting while the cashier talks with each person in line, or people recognize each other on the street and stop in the middle of the road. People also talk more slowly than "on the mainland" (what we call the continental US), and receiving mail can take a lot longer too. Living on an island out in the middle of nowhere makes some people feel like Hawaii is really a lonely place. A sign post in Kula, Maui, showing distances from the rest of the world. Kaimuki is part of Honolulu on Oahu. A fascinating glimpse at what life is like on the Hawaiian Islands. Living in the Western US with wide open spaces, I don't know if I would get rock fever. I'm sure I would be fine for a nice two-week vacation! It's interesting how the different islands don't want to be connected. They each must want to maintain they're own distinct identities. Courtney, so the only way to get to the different islands is to fly? I always assumed you could easily 'island hop' maybe by ferry. Interesting post. I really love your a-z posts. I dream of visiting Hawaii some day, I think I'm going to have to spend a lot of time there. There's so much to explore! Once upon a time, I was walking towards the entry checkpoint to the interisland terminal when this family whizzed by me. The woman checking people through said to no one in particular, "What's the hurry? Take the next flight." I visited Oahu during the total eclipse of the sun in 1991. The people were so friendly, as were the tourists who shared their sun protection so we could gaxe at the sky. That's the good thing about small populations. I am really enjoying your posts. Never been to Hawaii although I've had family and friends who lived there. Seeing Hawaii through your eyes is a treat.